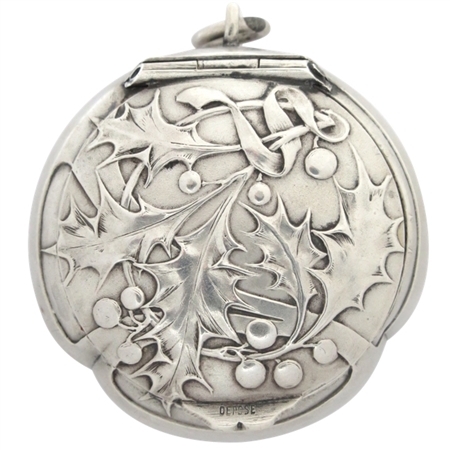 This very special patch box from 1900 is embossed with holly leaves and berries on both sides. Has a ring which allows it be worn as a locket. Interior houses the original beveled "fish-eye" mercury-glass mirror with some loss. Hallmarked.1.5 inches across, and the price includes 1/4 oz (8 ml) solid perfume of your choice. Patch boxes came into use during the 18th century at the court of Louis XV, where the use of "beauty patches" was popular. A beauty patch was made of gummed silk and was pasted on the skin as a "beauty mark" to emphasize a woman's facial feature, usually the cheek.